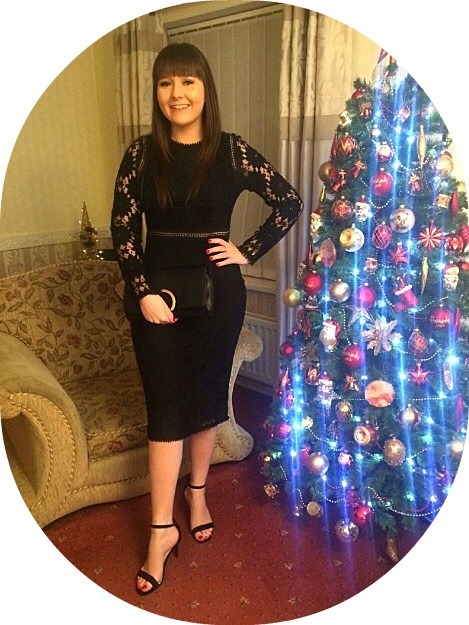 Today's post, to fit in with my week dedicated to being a student, is all about how to save money and earn rewards. As you can see from the above image, I am quite the fan of saving money and earning rewards. 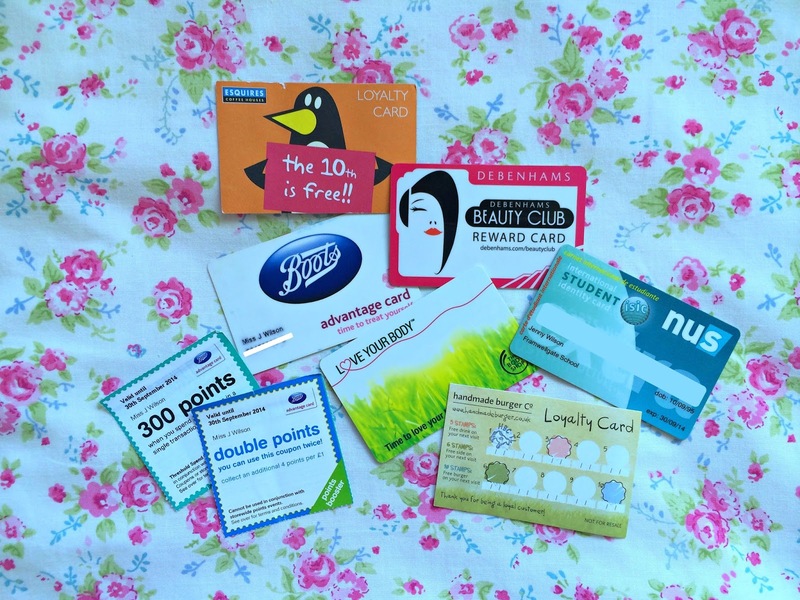 Probably the best loyalty card out there (well to me it is), the Boots Advantage Card allows you to collect 4 points for every £1 you spend and you can then use these points to spend in store or online. What's even better about Boots is they often run special offers which can double your points or you can sometimes earn 300 points if you spend £30. Furthermore, Boots have a special app for your phone where you can find offers tailored especially for you. The Debenhams Beauty Card is probably my least favourite of the cards I own. The Beauty Club card lets you collect points and earn rewards when you purchase Beauty, Fragrance and Beauty Electricals. However, you have to earn so many points before you earn money off/rewards and they also expire if they aren't used. The Body Shop Loyalty Card is the latest in my collection. This card is usally £5 to buy however, the day I went in store, they offered me it for free with being a student. The Body Shop Loyalty Card entitles you to 10% off purchases for a year, £5 off an in store purchase in the month of your birthday, a free product to the value of £5 on your 4th stamp, a free product to the value of £10 on your 8th stamp, invitations to exclusive events and news updates of the latest product launches. The NUS Student Discount acts as proof that you are a student and allows you to get discount at anywhere that offers students discounts both in store and online. Another new addition to my cards is the Handmade Burger Co Loyalty Card; this card is a one which involves collecting stamps. On your third stamp you receive a free drink, your sixth is a free side and your tenth entitles you to a free burger. The final loyalty card in my collection is the Esquires Loyalty Card; like the Handmade Burger Co card, this is also a card which you collect stamps on. And on your tenth stamp you can receive a free drink of your choice. As well as using loyalty cards, I have also been using 'Shop and Scan' for the last few months and have already had £30's worth of vouchers, 2 for Debenhams and 1 for Amazon. 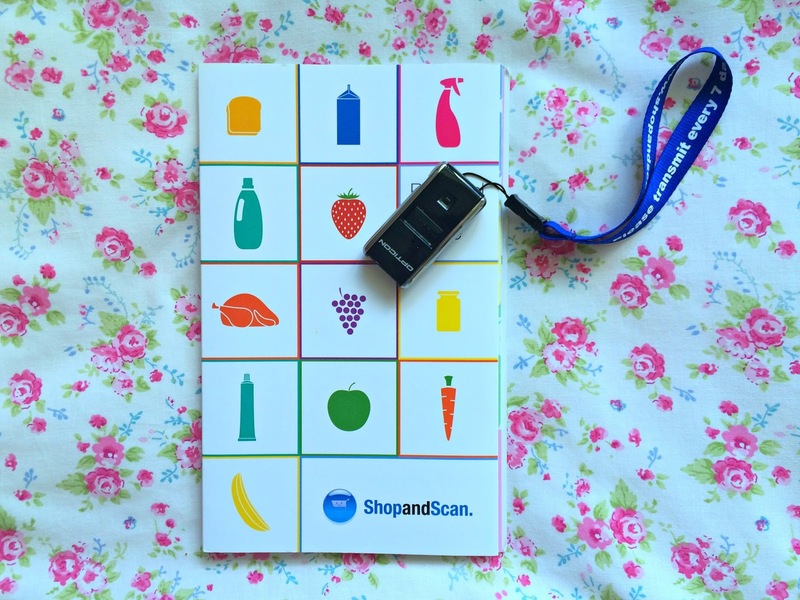 'Shop and Scan' is a simple way of earning vouchers, all you have to do is scan your shopping once a week, transmit your barcodes and earn your points. Each transmission earns you 1100 points and once you reach 10000 points you can get a £10 voucher to spend at a store of your choice from the list available including Debenhams, Outfit, Topshop, Argos, Pizza Hut and many more! What do you use to earn rewards and save money? P.S Today is my birthday! !